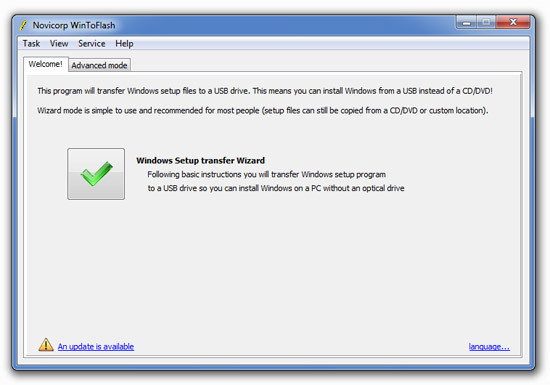 Here is a quick and easy to use tutorial to install Windows on your PC using USB drive. What we require to create bootable USB drive? First of all you need to download WinToFlash to create bootable version of Windows. Now insert the Windows CD/DVD in optical drive or mount the Windows ISO image using Daemon tools. Now run WinToFlash that you downloaded in Step 1. Once you run the application, you will see a window as shown in following screenshot. Go to Advanced mode and select your version of Windows that you are installing and hit Run. After that browse for your Windows source path and USB drive path and again hit Run. Now it may ask you to format your USB drive. Continue this process and after few minutes you will get bootable version of USB from which you can install Widows on your PC or laptop easily. Note: When you install Windows using USB you need to change first booting device to USB in your BIOS settings. I’m using this method from past 3 months and I never used optical drive. I hope this tutorial help you to easily install Windows from USB. If you have any doubts, you can leave your comments. If you have any other method to install Windows from USB, please share it with us so that others can also benefit from it. Great share bro. Thanks for sharing this. hey..gr8 info 🙂 and wat abt the pendrive capactiy should be for installing windows ..it is 2 gb or 4 gb?? The pendrive capacity should be 4 GB minimum. I too used to make USB bootable using DOS commands earlier but this application made the task too easy. It require only few clicks. Thanks Simran for the wonderful article! I loved it! I’m going to try it straight away. I think installing from USB will be faster? Yes, installing Windows from USB is much faster than installing it from CD/DVD. Hey thanks for this useful tutorial bro. I haven’t encountered any problem wiht my system till now, but to be on the safer side, I copied my OS to a pen drive and I am having it will me all the time. good post.. when a pc crashes due to virus or any other reason u can always boot from a pen drive and recover ur data before formatting or installin a new os on the system , fr that u can set boot from usb option in the bios settings , isnt it? I tried this with XP on my asus p4p-800 I got it to boot & start the set up but then I get the BSD says check my drive for virus. I have tried installing XP on my Windows 7 one hundred time (from USB). Hope to be luckier this time! I will give the software a try!